We got fennel from our CSA box and I remembered that last year Marulka had made an amazing fennel and celery salad, topped with shaved cheese. Well I was out of celery and did not have any cheese so I decided to improvise and used only the ingredients that we got from the box. The result was awesome! 1 fennel bulb, cleaned and thinly sliced. 2 heads of bok choy, cleaned and thinly sliced. 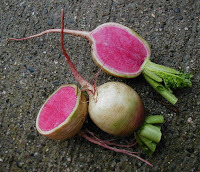 2 watermelon radishes, washed, peeled and thinly sliced. some olive oil, salt and black pepper. Wash all vegetables well and slice thinly (i used food processor and it took 30 sec!). Mix in a large salad bowl and add some olive oil, lemon juice and salt and pepper to taste. Garnish with the leftover fennel fronds and enjoy!